St. Francis of Assisi did not embrace the radical call to conversion until he found Christian hope in his physical embrace of a person with leprosy. In the face of the extreme suffering of the untouchable person, St. Francis did not abandon the outcast but instead loved him all the more. He became very close to him in his suffering. It was this embrace that led St. Francis to give his life as a living sacrifice for the poorest among him. Mother Teresa, also, found hope where nobody else saw it. Confronted with the overwhelming conditions of the streets of Calcutta, Mother Teresa placed her hope more completely, more radically, in the love of Christ. She and those who followed her became a sign of the love of Christ for the suffering amidst intense conditions of despair, poverty, loneliness and disease. Mother Teresa opened her heart to Christian hope, thereby radically transforming lives for the purposes of love and compassion. It is in this context of recognizing and celebrating such concrete manifestations of hope in the lives of followers of Christ that I reflect on my recent trip with a group of Alaskan youth and chaperones to Rio de Janeiro, Brazil, for World Youth Day (WYD) with Pope Francis. Today, young people would be right to question the meaning of life. Our youth would be right to be frustrated and disappointed by what they have found. They would be right to be fearful and angry about the world they are receiving from the hands of previous generations. Our youth are constantly bombarded by messages and images of what they should be, what they need (to buy) to make them fulfilled. They are inundated with sexual objectification, abuse and violence in the entertainment culture. At school they often times encounter a culture of exclusion, deception and substance abuse. They would be right to question whether there was any ultimate meaning to life, asking if there wasn’t anything more than the things, social status, pleasures and comforts this world offers. They would be right to seek more, to go deeper in their search, to embark on the search of the human spirit. World Youth Day began in 1984, when Blessed Pope John Paul II invited youth from around the world to Rome. While this event was intended to celebrate Catholic faith, the Holy Father invited all youth, regardless of their religious beliefs, to participate. This open invitation to youth, ages 18-35, to gather as a sign to the world of the unity and peaceful presence of cultures and peoples from around the globe has remained a feature of every World Youth Day. Pope John Paul II recognized that young people naturally are hopeful, especially if that hope hasn’t been strangled out by messages of despair and a lack of love and justice in their homes and communities. He also recognized that youth need to participate in Christian hope as a living reality. 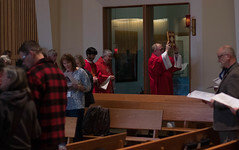 It is in the context of coming together as a people of faith, a people of Christian hope, that youth were able to embark more fully upon the path of life in the spiritual realm, the path that St. Francis found in the leper, and Mother Teresa found in the souls of the suffering on the streets of Calcutta. Our Alaskan youth overcame many difficulties to make it to WYD in Rio. Many are aware through an article in the Juneau Empire that close to $200,000 was entrusted to a travel agency organizing World Youth Day and that, shortly before it was time to depart for Brazil, the company declared bankruptcy. 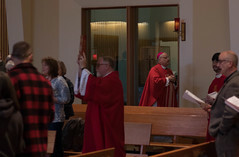 Faced with a significant crisis, the Bishops of Alaska chose to use diocesan funds to salvage the trip in the hopes of recouping the money through fundraising efforts. We had to place our hope in Divine Providence which in turn helped keep hope alive for our youth. Many people came forward to donate, to participate in their hope for our youth to witness a historic moment (the first Latin American Pope on his first trip back to his continent since his election) and experience a trip of a lifetime. We are grateful to all who helped by their willingness to give. 3.5 million people came to the final Mass on Copacabana beach. There were 56 Alaskans among them, who persevered in hope amidst some real challenges, to join with other people of faith an expression of their hope in God, and his loving presence among us in Christ and the Church. In the tradition of Christians like Mother Teresa, and St. Francis, the people of Alaska have opened their hearts to receive the hope that comes from living the Gospel message. Our youth are finding hope in a culture where many are losing it and many work to undermine it. This hope is not based on an individual sense of fulfillment, but instead, it leads people into the lives of their neighbor through loving support and outreach to the poor as Pope Francis has clearly demonstrated. As these young people return to their Alaskan home, I trust that by acts of charity and self sacrifice, the hope that young people are looking for today will bear fruit through such expressions of love and compassion.